When does Run Amok trigger? Run Amok triggers as soon as the run ends, similar to Dirty Laundry or Doppelgänger. Can the Runner use Run Amok to trash a piece of ice the Corp rezzes during the run but then uses Test Ground to derez before the run ends? Yes. Run Amok only cares that the ice was rezzed during the run, not whether or not the ice is still rezzed at the end of the run. I have a personal fondness for cards which force your opponent to choose their punishment. The most similar comparison to Run Amok is Bribery out of criminal. That card is pretty bad, though. Is Run Amok any better? When you play Run Amok, the corp is essentially given two options. The first is to rez one or more pieces of ice, taxing the runner or ending the run as needed. But if they do that, then Run Amok has a target: and because the card doesn't specify a successful run, bouncing off a barrier or jacking out still allows you to trash the card that just got rezzed. If this happens, the card is essentially the fourth Cutlery (Forked, Knifed, or Spooned), as an ice-trashing run event. It's slightly better in the fact that a) you don't need to have the right tool for the job. you can Run Amok on anything, and b) you don't have to be able to break it, meaning you can threaten ice destruction with 0 programs installed. However, the catch is that it only works on unrezzed ice, so sometimes you might end up destroying an Ice Wall or a Pop-up Window. Losing ice is bad for the corp, though. If they stand to lose something important, the corp might just decide not to rez. In this case, it acts like a more versatile Blackmail, since it doesn't require bad publicity to trigger. Now every Anarch can share in Valencia's fun, and Val herself can double up to have six no-rez runs per game, or nine with Same Old Thing. That hurts, a lot. So whichever choice the corp makes, something good for the runner happens. But the catch is that the decision of which option it is is given to the corp, not the runner. And so you have to assume that you're always going to get the worse of the two options. So it's not a particularly consistent card, and it's never going to be an MVP of a deck. You can, however, pack things to make it better. Going heavy on ice destruction with Parasite, Cutlery, Immolation Script, and possibly Kraken will increase the pressure on the corp to not lose ice, giving you more free accesses with Run Amok. On the other hand, using rez-detterent tricks like Blackmail, Cyber Threat, or Running Interference will make the corp reluctant to hand off free runs, and will thin their ice out to do so. All told, it's a very solidly designed card, fitting nicely in the Anarch faction. As a strong run event, it might see play in Ken Tenma, although the three influence makes it somewhat difficult to justify. My preferred use is to break into a scoring server, often uncontested as the corp doesn't want to give up ICE if it isn't about to be match point. Often the corp will only have 1 piece of ICE that can really stop the runner (e.g. Little Engine vs Faust) or is counting on the taxing power of the full server to keep runners out. In either of these cases, rezzing their carefully placed ICE only to see it destroyed, regardless of run success, is typically both demoralizing and more damaging to the corp than it is to the runner. There are plenty of other uses, but right now, in the current meta, there is often an early-mid game window where the corp can price a Faust runner out of a scoring remote with a few choice ICE. Run Amok solves these servers so long as the runner leaves them face-down and pressures centrals instead. I only slotted this card in the night before my SC, because I was sick of Street Peddler trashing my events. Run Amok bought me free access to many of my 2nd and 3rd agendas, and quickly became more important than viruses for Déjà Vu recursion. There is no question in my mind that this card is better than Bribery, Running Interference, or even Inside Job. The uses are slightly different, but particularly in the current Faust-heavy meta, this card is an all-access pass to an unrezzed server. It's also worth mentioning that Run Amok is exceptional at getting into 1 ice servers, allowing it to be used as DDoS 4-6. That's because if the corp doesn't rez, then you steal the agenda. But if the corp does rez, you can let it fire, trash the ice, and then run the now undefended server. It even stacks with DDoS, allowing you to get into two deep servers. This card has 2 main scenarios: before your breaker suite is complete, and after. Scenario 1: Incomplete Rig - When you play this card, you are essentially asking the corp "are you willing to trash that ice to protect what's in that server?" If that unrezzed ice wasn't going to keep you out anyway, you've paid 3 to play the card when you could have just payed to break through the ice, and the corp probably isn't going to sacrifice a piece of ice that wasn't going to stop you in the first place just to tax you a few credits once. OR that piece of ice would have stopped you, which means the decision is now "is what's in that server worth losing that ice?" aka "is that an agenda?". If they do rez, you trash it, don't get in (or get hurt by a sentry), but CAN run again and get it, meaning they are basically throwing that ice in order to tax you some more. If they don't rez, you get to pass it and get in, but is the thing they were willing to let you have worth paying the 3 and a card to get to it? Scenario 2: Complete Rig - The corp knows that as long as you have the money to get in, you can get through whatever they rez. The only way they will stop you is if they rez something you can't pay for, which is probably a really expensive piece of ice like a Tollbooth or something. Again, the question is "are you willing to trash that ice to protect whats in that server?" Again, the corp will probably not trash an ice just to tax you once, unless it taxes you enough to keep you from running that 2nd time, meaning if they bother to rez, even if you don't get what's in that server, you will probably get rid of something really nasty. If they don't rez, you get something that the corp didn't deem worthy of throwing an ice for, which means it's probably not an agenda or super-important combo piece. 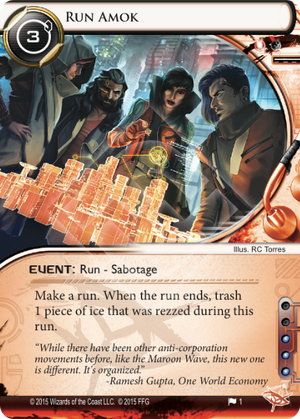 It seems to me that the later in the game, or rather the closer the corp is to winning, the less useful the card is, since the corp will gladly sacrifice an ice to save their winning agenda. This card is like the anarch version of Inside Job, but to be used well the strategic situation needs to be read VERY carefully or this card could be easily wasted. I would very much like to see this card used by high-level players, but my guess would be that it's best applied in a very ice-destruction heavy deck rather than all by itself. It could be a very nice psychological tool against the corp, used to apply extra pressure on an opponent who's already losing ice left and right, they have to decide if they'll let you get free accesses just in the hopes of being able to set up anything resembling a scoring server later, giving you a lot of free tempo early.